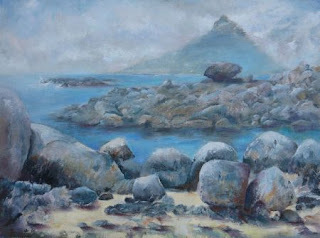 During the cold winter months we painted at Oudekraal. What a magnificent venue, so quiet and peaceful but oh so freezing. I don't know where summer has gone to as it is still freezing! Hi Carol, I can just feel the cold looking at this painting. Your paintings always have a good sense of atmosphere. Thanks Di - the Judges didn't like it though. Oh, those horrible judges! Their opinions can be so destructive to your creative process. Just get painting again and try to leave that judging experience behind you. An amazing view Carol I am so jealous - you have so many gorgeous paintings. I would love to share these with you but seeing your blog is the next best thing! I missed this post - Kirstenbosch got in the way! I remember this was the one that Ryno gave a crit on! It's quite spectacular. This is beautiful!! Such depth and atmosphere! Thank you both Liz and jgr. So nice to get such positive feedback! I agree, there is great depth in this. Love the blues and your rocks are perfect. Did you paint this on location in the cold? Thank you Barbara. This was started on location and completed in the studio with photos and memory!